There’s a whole lot I like about Chrome Industries products. Their products are aesthetically pleasing, they work with people I like such as Kelli Samuelson, they’re rooted in messenger culture without being exploitative or getting it all wrong and their bags have a lifetime guarantee. Because of that I have two of their bags in my collection already – the Chrome Barrage backpack that I reviewed here and the Niko Sling mini messenger bag that I used as a camera bag (around my waist) when I rode all the way around Taiwan last year. Before I continue, I’d just like to be a little clear with you about the way products and reviews appear on this site so you guys are able to trust the process. I’m contacted a hell of a lot and offered products for free in return for review on this site or promotion across my social media channels. As I’m short on time, I don’t like to write about products that don’t interest me or I guess, fit with my lifestyle or whatever. That kind of stuff probably wouldn’t interest you either, because I figure you follow my site because you like the same kind of things I do. Once I’ve been sent a product I use it extensively before I review it and if I have any problems with it, I email the company and talk to them about it. It could be something simple, for instance, I might need to update a cycle computer through an app. Or we could end up going backwards and forwards for longer than I’d like, trying to resolve a problem. If that happens, generally I don’t bother reviewing the item as I want to recommend products that work well. Likewise if I just discover the product is rubbish, falls apart, is hard to use or just badly designed, I don’t put it on here. A few flaws is fine. Junk is not. So with that out of the way, it stands to reason that I like the Niko F-Stop Camera Messenger bag as I’m writing about it here. It’s undergone plenty of real life testing, as so often what looks nice doesn’t turn out to be as practical as you first hoped. I’ve now taken it to races and used it as my sole luggage when travelling abroad, two of the most important tests a bag has to pass. It’s a winner if you’re looking for one of the best padded camera backpacks for cycling, or really for any kind of sport as it will carry multiple cameras, bodies, lenses, drones, microphones and equipment. The camera is fully black with only the Chrome logo showing a small flash of red. Even the signature chest faster is entirely black (rather than chrome) so if looking stealthy is your thing, this streamlined backpack is for you. With its really high quality straps, buckles, clips and D-rings and tough but smooth material, the look of the pack is high end and desirable meaning you could easily carry it when wearing smart clothes. 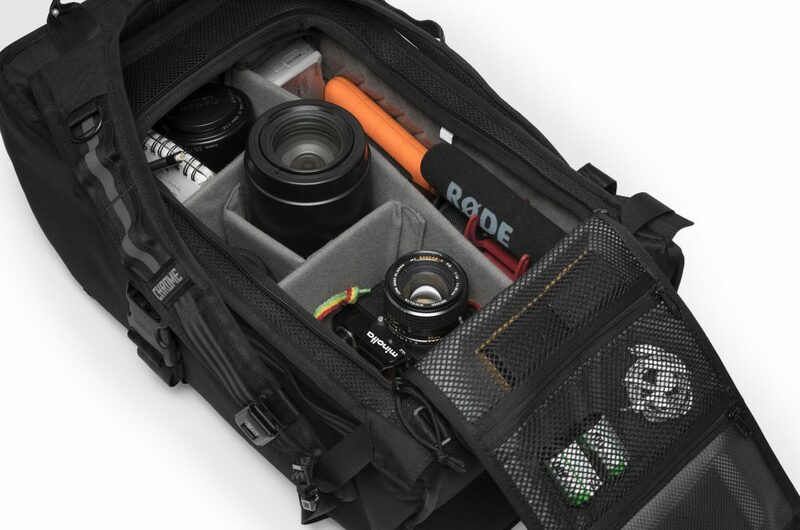 The shape is boxy as the pack is rigid so that your camera gear doesn’t flop about or get squished. 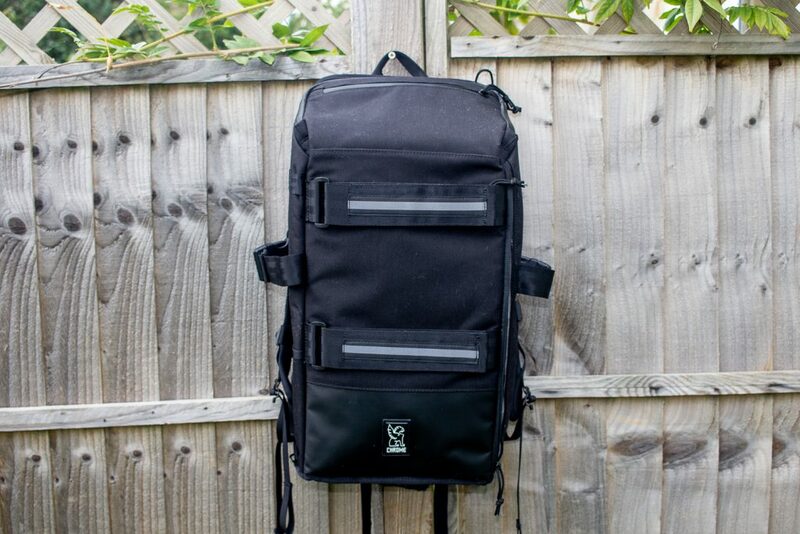 In terms of size, it’s spot on – it’s slim considering how much it carries so it doesn’t feel like you’re lugging a giant suitcase but still has enough room for all you need for either a weekend or a day out shooting/filming. The length is just right – I’m five foot seven and it doesn’t dangle over my bum when I ride. It’s worth ensuring the straps are set to the right length though or it can sit too high and interfere with the back of your helmet. The straps are well padded and comfortable, you can move the chest strap up and down to suit and there’s a non-padded, rather thin waist strap to keep it in place, though I never found I needed it. There’s some reflective strips on the shoulder straps so people can see you coming… from the front. The back panel is padded for comfort and has channels to help with air flow, though let’s face it, you’ll still get a sweaty back in the height of summer. 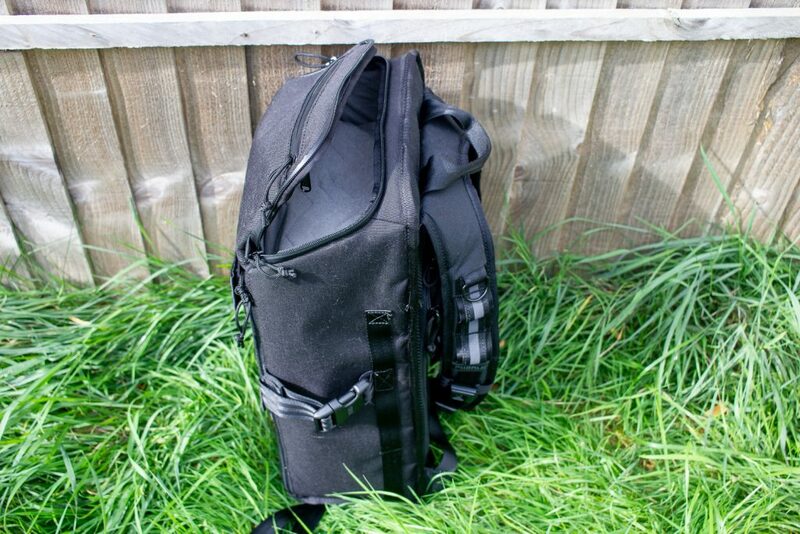 The main draw of the Niko F-Stop pack is obviously storage and it’s been really well designed in this regard. It’s 20 inches high, ten inches wide, has a depth of 7 inches and is said to carry 23 litres. The entrance of the main storage compartment is on the underside of the pack – the opening is against your back when you’re wearing it. This means that people can’t surreptitiously unzip the bag and walk off with your treasured possessions. It also means that when you lay the bag down on the floor, the outside facing part touches any dirt rather than the bit you’ll later pick up and wear against your clothing. When it’s on the floor, it’s easy to unzip the large main compartment and access all your stuff. The full zip compartment is well padded and there are velcro fastened dividers that you can move around to suit your needs. When I travelled to Belgium recently I had my shoes, clothes, cameras, mic and everything in it, all nicely separated and it worked very well. It’s worth playing around with the dividers and finding a system that suits – the compartment is less accessible right at the top end (top end if it were being worn) so you could find it’s a bit fiddly if you put small items there. The underside of the flap is home to several zippered pockets that are ideal for storing memory cards and other small items. At the front there’s a plush 13 inch laptop sleeve that’s accessed via a long zip on the side. 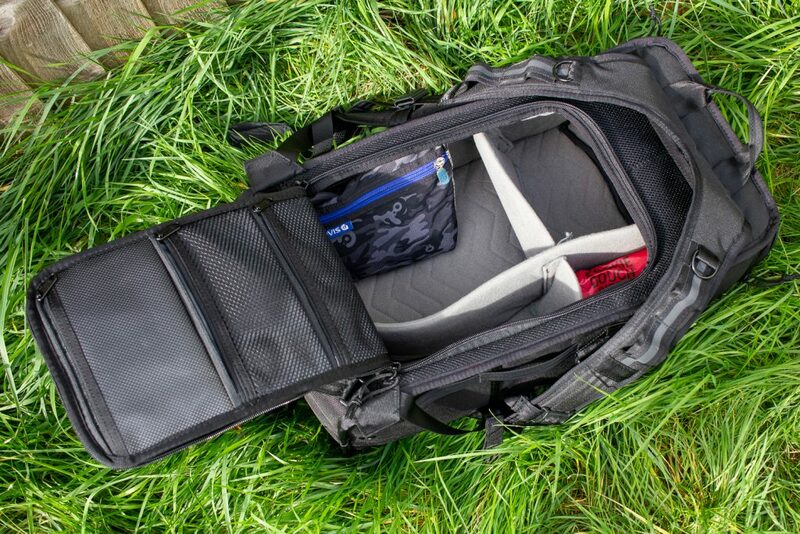 There’s a side pocket that holds a bidon and velcro front straps that can be used for carrying a skateboard, a jacket or whatever other bulky stuff you can’t fit inside of want to keep within reach. There are a couple of side straps that can be used for attaching your tripod or yoga mat. I’d like it better if there were two on each side as I worry that stuff will fall out if I attach it using just one. A top pocket (top when it’s being worn or standing up) is plush lined with a full length zip and just the right size for a DSLR, making it ideal for stashing the camera you’re currently using. There’s also a small, zippered top pocket which is the right size for a wallet and phone. 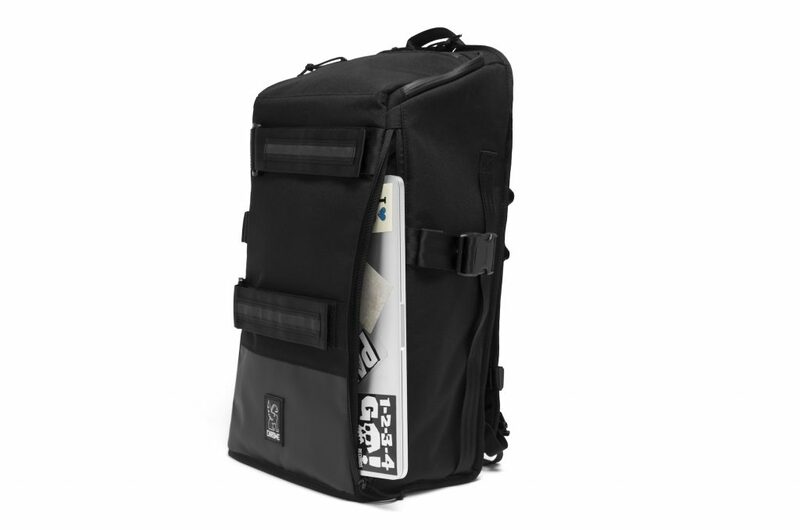 The backpack is made of ballistic grade nylon which is tough whilst still looking good. In the couple of months that I’ve been using it the bag hasn’t changed at all – it still looks brand new – so I’d guess it’s going to last a long time. It’s fully waterproof with special zips that don’t allow water in (I’m sure they have a special name but I can’t remember it!). Straps and clips are solid and durable and you’ve got Chrome’s lifetime guarantee against any manufacturing defects. I liked the way the main compartment is accessed by removing the pack and lying it down – I usually shoot with one camera at a time that I store in the top stash pocket which I can easily access. If you are constantly switching cameras, it could be a little impractical I guess though you could just remove one shoulder strap, swing the bag round to the front and access the main compartment that way. 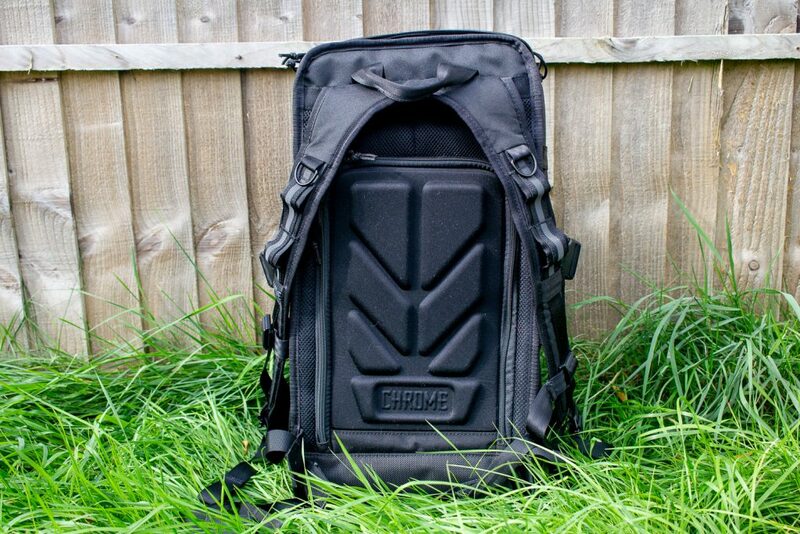 The bag is really lightweight, which I’m pleased about as I’ve found other Chrome packs on the weighty side. I’d prefer two straps on each side for carrying my tripod. I’ve got the bag and while I do really like it, I have to say I’m flabbergasted that the laptop zipper is not weather-sealed like the ones on the top pocket. Hey, just started flowing you I am a part-time Screwball full-time Photographer (when someone pays me) Yeah Sadly, I had to Void my Warranty on my 1-year-old Niko Camera bag and they sent me this one. I love it, but your right two straps or even a velcro enclosure on the side would be nice. the water bottle pocket is to flush and tight against the bag, you can’t fit a decent water bottle inside it! but since I didn’t’t have to pay for it, nor have it shipped to Mi Casa. I am pleased!!! !